Theravada Buddhism comes from the teachings of the Buddha, who lived in the 5th century B.C.E. The Theravada (School of the Elders, in the Pali language) is the sole surviving branch of the earliest Buddhism. Its primary emphasis was on monastic life, with the single goal of individual Liberation through Enlightenment, until the early 20th century, when it became more widely available. Laypeople are encouraged to practice generosity (dāna) and morality (śīla) in hopes of a better rebirth with the opportunity for more meditation practice. The number of Theravādins within the worldwide Buddhist community is difficult to assess since many contemporary Western Buddhists freely incorporate elements of various Buddhist groups in their practice. The Theravada are sometimes pejoratively called the Hīnayāna (Lesser, or Smaller, Vehicle) by other branches of Buddhism. Its disparagers see it as a teaching for only an elite few. The Buddha taught in a territory what is modern-day India and Nepal. A Sangha (community) of monks and nuns was well established by the time of his death. He said he taught one thing only: suffering and how to end suffering. He found the teachings of the Buddha on non-violence appealing and established the Buddha’s teachings as the moral background of his realm. His reign constituted a high point of early Buddhist culture. Trade and the growth of cities enhanced the growth of Buddhism. Buddhism in India later declined, in part due to the rise of Islam there in the 13th century. By that time, however, it had pervaded most of Southeast Asia. This branch produced a more popularized form of the Buddha’s teachings that incorporated strains of folk religion and other philosophies indigenous to the regions into which it travelled. It has major strongholds in Thailand, Myanmar (Burma), Śrī Lanka, Cambodia, Nepal, Laos, and other Southeast Asian countries, but only remnants of it are now found in India. Since the middle of the 20th century, it has held a strong presence in the West, where it tends to attract more educated people. Theravada teachings arrived in Great Britain in the late 19th century. They reached the United States later than the Mahayana, becoming established in the mid-1970s. They were brought mainly by young people returning from Peace Corps duty in Asia and by wayfarers searching Asia for spiritual riches. The Theravada presence in the West is sustained mainly by meditating laypeople. 4. - that a path of practice leading to liberation from suffering exists. 1. morality (śīla), 2. stability of mind (samādhi), 3. and wisdom (paññā). The wisdom steps are right understanding and right intention. The morality steps are right livelihood, right conduct, and right speech. The steps involved in meditation, which lead to stability of mind and, ultimately, wisdom are right effort, right mindfulness, and right concentration. Such distinctions are important to Theravādins since their tradition has a strong base in monastic discipline and meditation. This law of moral cause and effect states that chosen actions create states of mind, and that this has consequences. For example, minds dominated by hatred create hell realms for themselves, and those dominated by greed, a hungry ghost existence. Those in voluntary ignorance or delusion, such as that caused by polluting the mind with intoxicants, will be reborn in an animal realm. Excessive egotism and self-concern produce the demon realms. This realm is considered the most propitious for spiritual practice since it has enough suffering to be motivating and enough happiness to prevent becoming overwhelmed. Those with highly developed morality and generosity can inhabit the realms of devas, or lesser gods. The brahma-realms are attained through mental purity, such as being highly concentrated on beautiful states of mind. All of these realms are temporary and fall short of the fruition of Nibbāna (Nirvāna), which is explained below. Although actions plant seeds, other factors determine whether or not the seed will ripen. Weighty kamma, however, will override all other factors. Some examples of negative weighty kamma are killing a parent or harming a very holy person. These inevitably earn a long sojourn in the deepest hell. Attaining the first degree of Enlightenment is positive weighty kamma. Those who attain this will never again be born in a realm lower than the human one. Theravādins describe 10 pāramīs in a list that differs somewhat, however, from the usual Mahayana paramitas, but there is considerable overlap. Theravādins hold that, from the moment when he vowed to become a Buddha for the good of all beings, Gautama set about developing these 10 attributes to a high degree of perfection. When they appear in any being’s life, they signal that some spiritual progress has been made, though their attainment remains a continuing spiritual task throughout life. Generosity reflects the open-handedness needed for spiritual development; it is the opposite of the grasping that causes suffering. Asian laypeople commonly sign up months in advance to supply a day’s food to a monastery, for example. Śīla (morality), or right conduct, will be explained below. Renunciation is surrendering whatever stands in the way of coming to Nibbāna. Wisdom, or correct understanding and intention, is a fruit of spiritual practice and the final liberator of beings. Diligence, often called effort, energy, or courage, is persistent application to right living and spiritual practice. This quality appears in more Theravada lists than any other as a necessary attribute to develop. Patience involves acceptance of the rate of growth and of what happens in the process of growth. Truthfulness goes beyond the morality of not lying: It requires that a being become truth. When truthful beings give their word, they will follow through. They see themselves clearly and without sham. Resolution or resolve is staying with the task of spiritual work; sometimes this involves taking special vows to further the work. Metta is loving-kindness or gentle friendliness practiced toward all beings without discrimination. Finally, equanimity is having a balanced mind that is not altered by changes in fortune. 1. Nibbāna, 2. consciousness, 3. colour & form, and 4. mental formations. The Mental formations are “colorations” of or contents in the mind through which all else is experienced. For example, when a person is angry, all is perceived through that filter or “dye” of anger. Each of the 4 realities exists in its own right, and all but Nibbāna are conditioned—that is, subject to laws of cause and effect. Theravada thought defines laws governing matter, life, mind, volition (the law of kamma), and the dispensation of the Buddhas. 3. “no-self” (anatta), the condition of there being no permanent essences. Contemporary teachers commonly approach it in terms of the interconnectedness and the mutual interdependence of all things. The Pali canon offers unique details for understanding these characteristics. They include the discomforts of many bodily processes (Dukkha Dukkha), including hunger, tensions, aches, accidents, illness, aging, and death. There are also the torments of the mind— unwelcome emotions, obsessive patterns of thought, unpleasant moods, the inability to control the mind, mental illness. All entail a loss of happiness (Vipariṇāma Dukkha). Incessant change that cannot be altered or controlled is also a form of Dukkha (anicca Dukkha); since nothing lasts, nothing can be relied on as a dependable support. Samsara Dukkha is the ceaseless battering of the senses with harassing experiences. Finally, there is the deep Dukkha of being an apparently individual being, of attachment to the processes making up that being, and of clinging to the sense of being a separate self. The mind creates this prison. All of culture, religions, political systems, philosophies, and other human creations have the same reality status as dreams and trains of thought; their survival depends upon human minds continuing to support them. the unborn, undying, unchanging, and completely satisfying. In contrast to some other groups, Burmese Theravādins tend to see it as beyond consciousness, which contrasts with a Mahayana notion of Nirvana as a state of consciousness. Some Thai Theravādins consider Nibbāna to be the pure released mind resting in objectless, pure consciousness. Theravādins note, however, that spiritual practice, which requires getting deeply in touch with suffering, necessarily brings compassion in its wake. Theravādins commonly refer to Nibbāna as a cessation experience. It involves the “blowing out” of the fires of desire. Sometimes it is called the “coolness” that follows the extinguishing of desire. Others speak of it as the cessation of “thingness” or separateness. The Pāḷi Canon portrays the Buddha as emphasizing that Nibbāna is neither non-existence nor a state of existence as we commonly think of such states. It is also not an annihilation or extinction, nor is it a realm of existence. Theravādins tend to see Enlightenment as the result of considerable personal effort sustained over a long period of practice. This contrasts with some Mahayana schools, which speak of sudden, seemingly unbidden, breakthroughs. The second Enlightenment greatly reduces greed and hatred, and the third eliminates them. The fourth removes all remaining hindrances, including conceit and restlessness, and is the culmination of the path. For Theravādins, the final level of Enlightenment means that, upon death, the Enlightened will “die into” Nibbāna and never again be reborn into the rounds of existence, or samsara. This represents the ultimate goal of practice. This teaching is one basis for the dismissal of the Theravada by some Mahayana schools as lacking social consciousness. Buddhists all tend to accept the same basic moral code, though even within schools some differences of opinion exist. Morality is extremely important in the Theravada tradition, which sometimes refers to itself as an ethical psychology. Morality offers guidelines about what causes suffering so one can avoid harmful action. It is never seen as commandments or injunctions handed down by authority. Theravādins have deeply analysed the 3 morality steps of the Noble Eightfold Path. Regarding right livelihood, professions that necessarily involve infliction of suffering are to be avoided. Theravādins are not to be butchers or soldiers. They are not to deal in weapons, intoxicants, or living beings. For laypeople the moral code for right speech and right action is most commonly expressed in 5 precepts or guidelines for conduct. Detailed lists in the Pāḷi Canon describe the conditions that must apply for a violation of right action to have occurred. The Buddha allowed his monks, who were itinerant beggars, to eat what was given them so long as no one killed an animal especially for them and the food was clearly leftovers. Some Theravādins, including some monks, continue to accept this guideline. Other contemporary people, invoking knowledge of the law of supply and demand, argue for vegetarianism. All agree that directly taking life, even that of insects, is forbidden. It covers various forms of stealing and fraud, which the Pāḷi scriptures carefully detail. Many contemporary Buddhists add that the right to use something should not be assumed and that borrowing without permission is not acceptable. The third precept is to avoid sexual misconduct; it is often expanded to include control regarding all sensory appetites. The underlying principle is not to use sensuality in a way that harms anyone. 2 major guidelines require honouring the sexual commitments of all parties and avoiding sexual contact with inappropriate partners, which include children and criminals. Contemporary Buddhists have added to this list relationships in which there is an imbalance of power, such as those with clients or students. Most rule out casual sexual contact because it cannot be known what harm it might cause. Lying is always seriously wrong, as is speech that foments discord among people, such as malicious gossip, slander, and tale bearing. This latter is seen as an especially serious offense that can lead to expulsion from a monastic community. The third guideline is to avoid unnecessarily harsh speech; one should not speak in anger or other uncontrolled states. Finally, frivolous speech without a purpose should be avoided. What is spoken is to be said at appropriate times and in appropriate situations. Most in the monastic communities hold that this prohibits all mind-altering substances, including alcohol. Some contemporary Buddhists argue that it means that such substances should not be used to the point of intoxication. The most common are to avoid eating after noon, to refrain from adorning the body, to avoid certain forms of entertainment, to eschew high and luxurious beds and chairs, and to avoid handling money, gold, or silver. Contemporary nuns commonly follow 8 or 10 precepts, based on these additional precepts, although initially their code of conduct was more extensive than that of monks. The monks have an elaborately detailed monastic code with precepts governing minute details of life. At an uncertain date, believed to be within 100 years of the Buddha’s death, an organizational assembly of 500 fully Enlightened monks met to discuss teachings and writings. 3. the Abhidhamma, which presents a philosophy and psychology. They are all written in Pāḷi, a dialect of Sanskrit, and are thus known as the Pāḷi Canon. The Theravada recognizes only this canon and does not use the later Mahayana texts. His recollection formed the basis of the suttas (sutras [sermons]) of the Buddha, the major component of the Dhamma. These sermons begin with “Thus have I heard,” citing Ānanda’s recall of the Buddha’s words. The Vinaya was said to come from another monk’s perfect recall of the precepts of the monastic discipline. The Theravada uses few symbols in contrast to many other Buddhist schools, some of which make great use of icons and other sacred objects. Theravada Altars often bear flowers. A symbol for the Triple Gem of the Buddha, Dhamma (teachings), and Sangha (community) is sometimes present. Stupas, sacred mounds originally designed to hold relics of the Buddha, dot the landscape in many Theravada countries. Various icons and statues are found all over Cambodia, Śrī Lanka, Thailand, Myanmar (Burma), and other Buddhist locations. In Afghanistan the Taliban destroyed many stone Buddhas. Theravādins generally do not consider the Buddha divine, although some of the laity have divinized and worshiped him. Officially the Theravada reveres the Buddha as a great man who found a solution to a common human problem. It shows the Buddha reaching down to touch the ground, responding to the challenge of Mara (evil personified) by calling upon the earth to bear witness to his years of spiritual practice and his right to seek Enlightenment. Until fairly recently Theravada Buddhism remained relatively hidden in its monasteries in Southeast Asia. In the early 20th century the Burmese master Mahasi Sayadaw (1904– 82) made the Theravada more universally available by opening meditation practice to the laity with his mental noting method for Vipassana, or insight meditation. Somewhat later U Ba Khin (1889–1971) developed the body scanning method and began teaching the laity. The chief contemporary leaders of the schools of Mahasi Sayadaw and U Ba Khin are U Pandita Bivamsa (born in 1921) and S.N. Goenka (1924-2013), respectively. have remained guiding teachers of the Insight Meditation Society, the first major centre in the United States, which has a Burmese flavour. Jack Kornfield (born in 1945), who was also instrumental in founding this group, later established a West coast centre. Bhante Silananda (1927–2005) guided another in California. The late Thai master Ajahn Chah (1918–92) had many disciples. Some of them have founded major centers in Australia and England with the flavor of the Thai Theravada. Ajahn Sumedho (born in 1934), a major disciple of Ajahn Chah, guides an English center, Amaravati. Although not considered a Scripture, Buddhaghoṣa’s Viśuddhimagga, composed around 500 C.E., is the major classic Theravada Buddhist work. Some important contemporary Theravada writers include Bhikkhu Bodhi (born in 1944), Bhikkhu Nyanamoli (1905 – 1960), Nyanaponika Thera (1901–1994), Matara Śrī Nanarama (1901– 92), Narada Maha Thera (1898–1993), Nyanatiloka Thera (1878–1957), Piyadassi Thera (1914 - 1998), Sayadaw U Pandita Bivamsa, Mahasi Sayadaw, Ajahn Chah, Ajahn Sumedho, Joseph Goldstein, Sharon Salzberg, and Jack Kornfield. The Theravada has no central authority. Monastic houses are relatively autonomous and are overseen by a head monk. A hierarchy within the monastery is based on length of time served as a monk, and monks usually eat in the order of the date of their ordination. In Asia men commonly precede women in all matters; this is usually not true in the West. Laypeople look to monks for teaching and to receive their vows. The holiest place for the Theravada is Bodh Gaya, in central India, which is considered the site of the Buddha’s Enlightenment. A temple marks the reputed spot of Enlightenment and a Bodhi-tree, said to be a descendent of the original tree under which the Buddha sat, is adjacent to the temple. Nearly as important is Sarnath, north of Benares, where the Buddha preached his first sermon. The original Deer Park where the sermon was given no longer exists, but the site is adorned with statues of figures involved in that first sermon. Near both sites various groups have built monasteries. Many lay Theravada Buddhists travel to practice at monasteries for full-moon days or more extended periods of time. Stupas, reliquaries of the Buddha, are also holy sites where people often choose to meditate. Although sacred space has been established in other locations worldwide, India contains the holiest sites. Although a lay devotional life exists, most Theravada Buddhists acknowledge no high gods. They consider heaven realms to be temporary abodes on the path to Nibbāna. They tend not to celebrate other holy beings, such as Bodhisattvas, who defer full and final Enlightenment to help other beings. Some practice devotion to devas, lesser gods in the realms just superior to the human one, who are believed to help moral and generous humans. Theravādins hold sensate life forms sacred and do not choose to take life. Contemporary Theravādins also tend to be highly environmentally conscious. Vesākha (Wesak), which honours the Buddha’s birth, Enlightenment, and death (parinibbāna), is celebrated on the first full-moon day of May. Uposatha days, whose dates are determined by the phases of the moon, are times throughout the year for extra meditation practice and the taking of vows. As in most other Buddhist groups, Theravada monks and nuns wear monastic robes. The colour varies from country to country: Most common for monks are russet, saffron, or brown and, for nuns, pink, peach, or grey. Laypeople who bind themselves to the 8-vow system of precepts sometimes wear white and refer to themselves as anagārika (homeless). The laity has no common mode of dress, though many wear white on special days, such as full-moon days. Theravada monastics do not eat until day has broken and commonly refrain from eating solid foods after the noon meal. Monasteries differ on whether they allow caffeine after midday. Laypeople often adopt these practices on full-moon days or on extended meditation retreats. Rice gruel is sometimes served on special practice days. While some Buddhist traditions have elaborate rituals, others are starker. The Theravada has the fewest rituals, and meditation remains the chief practice. There are vow ceremonies to become a monk or nun. Often “taking refuge” in the Buddha, the Dhamma, and the Sangha is chanted along with the moral precepts. Buddhist monastics frequently confess their faults. Some monasteries chant a loving-kindness practice in the evening, and some Theravādins practice sharing merit. Suttas are sometimes chanted, and occasionally other chants are sung. Some laypeople meditate, and some practice devotions (puja) to the Buddha and heavenly beings. In some cases civic ceremonies are imbued with a Buddhist flavour. 3. mindful awareness of the on-going flow of experience. It leads to the wisdom steps of the path of right intention (mostly compassionate care and non-harming) and right wisdom (clearly seeing and understanding reality). In addition to diligence, concentration, and mindfulness, these are raptness or captivated attention, investigation or having insights into reality, calm or stillness or mind, and equanimity or balanced acceptance of all experience. The path develops through alternating periods of ease and difficulty during which the wisdom knowledges unfold. These include understanding body and mind, kamma and cause-effect relationships, the characteristics of conditioned reality, right practice, and, ultimately, Nibbāna. Taking refuge in the Buddha, Dhamma, and Sangha, by which one becomes a Buddhist, is the major one. Entry into monastic life is also celebrated. Often a dying person is reminded of his or her good deeds, and scripture is read to him or her. Theravada marriage ceremonies are also available. contemporary ones usually do not do so actively. Compassion leads them to make teaching available to anyone who is interested enough to inquire. Western groups maintain websites and publish newsletters and schedules of retreats, which are sent to parties that have expressed interest. There has been outreach to some particular groups, such as prison inmates, minority populations, and similar communities. They do not attempt to impose their beliefs or practices on anyone. Some Theravādins, like some in the Zen community, have entered into dialogue with other monastics—most commonly Christians. Many support the Society for Buddhist-Christian Studies, and Resources for Ecumenical Spirituality offers retreats combining Theravada and Christian teachings. Historically the Theravada tradition has not been a prime mover regarding social justice issues, and some other Buddhist groups have faulted them for this. They are involved with many social justice issues—most notably, peace issues, environmental concerns, criminal justice issues and prison ministry, and the treatment of minorities. The Buddhist Peace Fellowship has many Theravada members. In recent times Myanmar and Śrī Lanka have seen considerable active work for social justice among Buddhists. In contrast to some other Buddhist schools, monastic life is the most highly valued Theravada lifestyle. In Asia monks are almost a caste apart from other men and all women, including nuns. For the laity Theravada positions are similar to those of all Buddhist groups. Honesty and fidelity are considered extremely important for those engaged in relationships. Parents are to be responsible for their children without forcing their own views upon them, and children are to respect their parents. The Buddha reportedly said that carrying a parent on your back for your entire life would not be adequate repayment for the gift of life. Traditionally Theravādins have considered investment in artistic production a worldly distraction. Nevertheless, some religious art is associated with the Theravada. It began with the stupas and progressed to the building of other temples and shrines. Early carvings of groups of the laity and monks assembled to hear the Buddha speak did not depict the Buddha. At some uncertain date representations of the Buddha began to appear, and some areas, especially Śrī Lanka, boast magnificent stone statues of the Buddha. 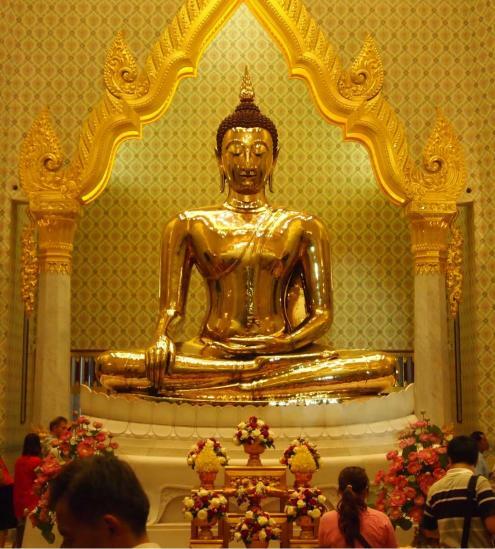 The Shakyamuni Buddha statue derives from the Theravada tradition, as do some symbolic depictions of the Triple Gem of the Buddha, Dhamma, and Sangha.